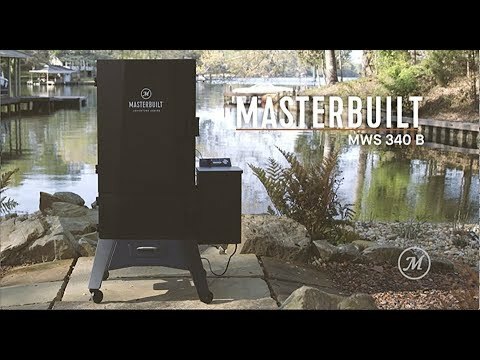 The Masterbuilt MWS 330B Pellet Smoker is designed with plenty of room to give all your favorite foods that delicious woodfire taste. With 4 chrome plated smoking racks, providing 724 square inches of space, you can smoke 2 turkeys, 3 pork butts, 4 racks of ribs or 12 chickens at one time! The digital control panel allows you to control the temperature and smoke time, as well as select preset smoke cycles. This smoker can reach temperatures between 180 and 350 degrees Fahrenheit. The automated auger system will feed pellets into the smoker as needed to maintain the desired temperature. A water tray sits at the bottom of the smoker to keep your food juicy and flavorful, and a heat diffuser evenly distributes heat. Cleaning out ash and grease is easy, thanks to a removable crucible and a side-access grease tray. For easy moving and transport, this smoker sits on 4 caster wheels and features a side handle. Masterbuilt smokers carry a one (1) year warranty against defects in material and workmanship under proper assembly and normal use. This warranty does not cover paint finish or rust. Masterbuilt requires proof of purchase, such as a receipt, for warranty claims. I was really excited about this smoker and still can't wait to use it but out of the box the doors were on (which the instructions suggested needed to be installed) and the top one was bent so the door was hard to open. Hopefully, it can't be pounded out. Continuing with installation some of the screws tops weren't finished so the feeder isn't as secure as it's supposd to be. Don't want to return because that's a whole process. It had to be brought in with a freight truck, I had to be home to sign for it and with it on the pallet it was marked 120 pounds. Just wish things could have been better out of the box. Is this smoker Gas or electric? Hi, Anne. This smoker is a pellet smoker. It does run on electricity, however, there is no electric heating element. The electricity powers an igniter rod to light hardwood pellets, an auger to feed more pellets from the hopper into the crucible and the control panel. This product can expose you to chemicals including Lead and Di(2-ethylhexyl) phthalate (DEHP),which are known to the State of California to cause cancer and birth defects or other reproductiveharm, and Diisononyl phthalate (DINP), which is known to the State of California to cause cancer.For more information go to www.P65Warnings.ca.gov.